Dixie St. John – Master Facilitator | Washington D.C.
Home » Washington D.C. » Dixie St. John – Master Facilitator | Washington D.C.
Greetings! 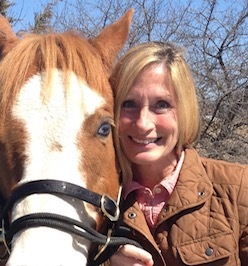 In addition to serving the Washington D.C. Metro area as an Equus Master Facilitator, I’m also a Certified Master Coach trained by Dr. Martha Beck and an instructor for her Life Coach Training program. My educational background is in Thanatology (Death and Dying) and I have extensive experience with grief and end-of-life support. My specialty and passion is helping my clients navigate and grow through the “in-between” following loss or transition. My Equus work has shown me how to be profoundly present – both with myself and with my fellow human beings. Where I once looked to external circumstances to define and explain my life experience, through the mirroring feedback of horses, I’ve learned to turn inward and recognize the power that’s innately and uniquely mine. From this place, I am able to truly lead with authenticity, clarity and purpose.